Meningitis is a potentially fatal inflammation of the meninges, the thin, membranous covering of the brain and the spinal cord. 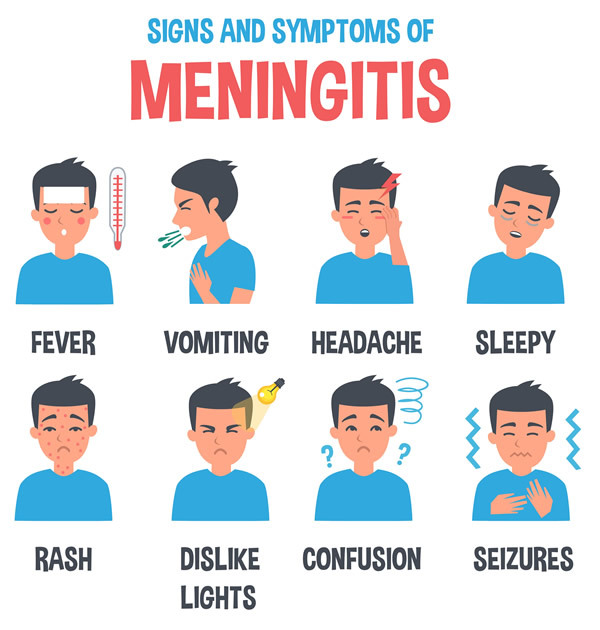 Meningitis is most commonly caused by infection by bacteria, viruses, or fungi, although it can also be caused by bleeding into the meninges, cancer, diseases of the immune system, and an inflammatory response to certain types of chemotherapy or other chemical agents. The most serious and the most difficult to treat types of meningitis tend to be those caused by bacteria. 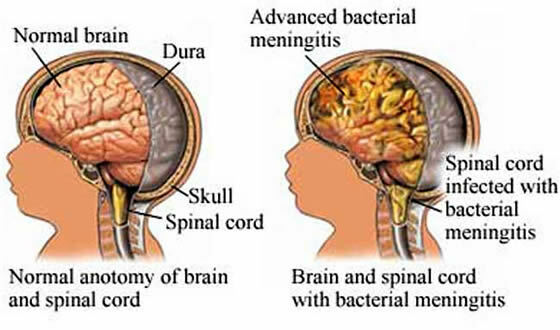 Meningitis is a particularly dangerous infection because of the very delicate nature of the brain. Brain cells are some of the only cells in the body that, once killed, will not regenerate themselves. Therefore, if enough brain tissue is damaged by an infection, then serious lifelong handicaps will remain. The dura is the toughest, outermost layer, and is closely attached to the inside of the skull. The middle layer, the arachnoid, is important because of its involvement in the normal flow of the cerebrospinal fluid (CSF), a lubricating and nutritive fluid that bathes both the brain and the spinal cord. The innermost layer, the pia, helps direct blood vessels into the brain. The space between the arachnoid and the pia contains CSF, which helps insulate the brain from trauma. Many blood vessels, as well as peripheral and cranial nerves course through this space. CSF, produced within specialized chambers deep in- side the brain, flows over the surface of the brain and spinal cord. This fluid serves to cushion these relatively delicate structures, as well as supplying important nutrients for brain cells. CSF is reabsorbed by blood vessels located within the meninges. A careful balance between CSF production and reabsorption is important to avoid the accumulation of too much CSF. Because the brain is enclosed in the hard, bony case of the skull, any disease that produces swelling will be damaging to the brain. The skull cannot expand at all, so when the swollen brain tissue pushes up against the skull’s hard bone, the brain tissue becomes damaged and the blood supply is compromised, and this tissue may ultimately die. Furthermore, swelling on the right side of the brain will not only cause pressure and damage to that side of the brain, but by taking up precious space within the tight confines of the skull, the left side of the brain will also be pushed up against the hard surface of the skull, causing damage to the left side of the brain, as well. Another way that infections injure the brain involves the way in which the chemical environment of the brain changes in response to the presence of an infection. The cells of the brain require a very well-regulated environment. Careful balance of oxygen, carbon dioxide, sugar (glucose), sodium, calcium, potassium, and other substances must be maintained in order to avoid damage to brain tissue. An infection upsets this balance, and brain damage can occur when the cells of the brain are either deprived of important nutrients or exposed to toxic levels of particular substances. The cells lining the brain’s tiny blood vessels (capillaries) are specifically designed to prevent many substances from passing into brain tissue. This is commonly referred to as the blood-brain barrier. The blood-brain barrier prevents various substances that could be poisonous to brain tissue (toxins), as well as many agents of infection, from crossing from the blood stream into the brain tissue. While this barrier is obviously an important protective feature for the brain, it also serves to complicate treatment in the case of an infection by making it difficult for medications to pass out of the blood and into the brain tissue where the infection is located. The most common infectious causes of meningitis vary according to an individual’s age, habits, living environment, and health status. While nonbacterial types of meningitis are more common, bacterial meningitis is more potentially life-threatening. Three bacterial agents are responsible for about 80% of all bacterial meningitis cases. These bacteria are Haemophilus influenzae type b, Neisseria meningitidis (causing meningococcal meningitis), and Streptococcus pneumoniae (causing pneumococcal meningitis). In newborns, the most common agents of meningitis are those that are contracted from the newborn’s mother, including Group B streptococci (becoming an increasingly common infecting organism in the newborn period), Escherichia coli, and Listeria monocytogenes. The highest incidence of meningitis occurs in babies under a month old, with an increased risk of meningitis continuing through about two years of age. Older children are more frequently infected by bacteria, including Haemophilus influenzae, Neisseria meningitidis, and Streptococcus pneumoniae. Adults are most commonly infected by either S. pneumoniae or N. meningitidis, with pneumococcal meningitis the more common. Certain conditions predispose to this type of meningitis, including alcoholism and chronic upper respiratory tract infections (especially of the middle ear, sinuses, and mastoids). N. meningitidis is the only organism that can cause epidemics of meningitis. For instance, cases have been reported when a child in a crowded day care situation or a military recruit in a crowded training camp has fallen ill with meningococcal meningitis. There have been case reports in recent years of meningitis caused by Streptococcus bovis, an organism that is ordinarily found in the digestive tract of such animals as cows and sheep; and Pasteurella multocida, an organism that usually infects rabbits. Other atypical cases of meningitis include several caused by the anthrax bacillus. These cases have a high mortality rate. Viral causes of meningitis include the herpes simplex virus, the mumps and measles viruses (against which most children are protected due to mass immunization programs), the virus that causes chickenpox, the rabies virus, and a number of viruses that are acquired through the bites of infected mosquitoes. A number of medical conditions predispose individuals to meningitis caused by specific organisms. Patients with AIDS (acquired immunodeficiency syndrome) are more prone to getting meningitis from fungi, as well as from the agent that causes tuberculosis. 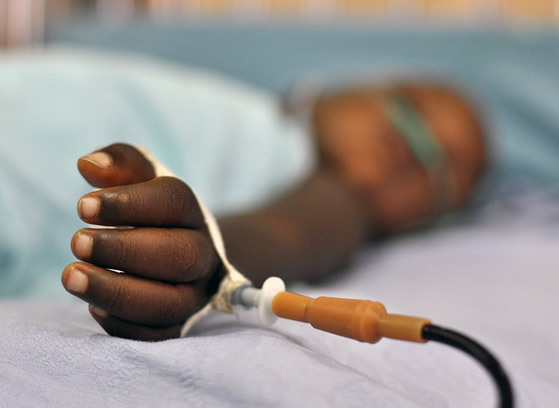 Patients who have had their spleens removed, or whose spleens are no longer functional (as in the case of patients with sickle cell disease) are more susceptible to other infections, including meningococcal and pneumococcal meningitis. The majority of meningitis infections are acquired by transmission through the blood. A person may have another type of infection (for instance, infection of the lungs, throat, or tissues of the heart) caused by an organsm that can also cause meningitis. If this initial infection is not properly treated, the organism will continue to multiply, find its way into the blood stream, and be delivered in sufficient quantities to invade past the bloodbrain barrier. Direct spread occurs when an organism spreads to the meninges from infected tissue next to or very near the meninges. This can occur, for example, with a severe, poorly treated ear or sinus infection. Patients who suffer from skull fractures possess abnormal openings to the sinuses, nasal passages, and middle ears. Organisms that usually live in the human respiratory system without causing disease can pass through openings caused by such fractures, reach the meninges, and cause infection. Similarly, patients who undergo surgical procedures or who have had foreign bodies surgically placed within their skulls (such as tubes to drain abnormal amounts of accumulated CSF) have an increased risk of meningitis. Organisms can also reach the meninges via an uncommon but interesting method called intraneural spread. This involves an organism invading the body at a considerable distance away from the head, spreading along a nerve, and using that nerve as a sort of ladder into the skull, where the organism can multiply and cause meningitis. Herpes simplex virus is known to use this type of spread, as is the rabies virus. The classic symptoms of meningitis (particularly of bacterial meningitis) include fever, headache, vomiting, sensitivity to light (photophobia), irritability, severe fatigue (lethargy), stiff neck, and a reddish purple rash on the skin. Untreated, the disease progresses with seizures, confusion, and eventually coma. A very young infant may not show the classic signs of meningitis. Early in infancy, a baby’s immune system is not yet developed enough to mount a fever in response to infection, so fever may be absent. However, checking an infant’s temperature to see if it is high or low could be an indication. Some infants with meningitis have seizures as their only identifiable symptom. Similarly, debilitated elderly patients may not have fever or other identifiable symptoms of meningitis. 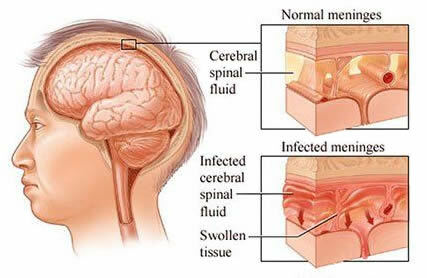 Damage due to meningitis occurs from a variety of phenomena. The action of infectious agents on the brain tissue is one direct cause of damage. Other types of damage may be due to the mechanical effects of swelling and compression of brain tissue against the bony surface of the skull. Swelling of the meninges may interfere with the normal absorption of CSF by blood vessels, causing accumulation of CSF and damage from the resulting pressure on the brain. Interference with the brain’s carefully regulated chemical environment may cause damaging amounts of normally present substances (carbon dioxide, potassium) to accumulate. Inflammation may cause the blood-brain barrier to become less effective at preventing the passage of toxic substances into brain tissue. A number of techniques are used when examining a patient suspected of having meningitis to verify the diagnosis. Certain manipulations of the head (lowering the head, chin towards chest, for example) are difficult to perform and painful for a patient with meningitis. The most important test used to diagnose meningitis is the lumbar puncture (LP), commonly called a spinal tap. Lumbar puncture involves the insertion of a thin needle into a space between the vertebrae in the lower back and the withdrawal of a small amount of CSF. The CSF is then examined under a microscope to look for bacteria or fungi. Normal CSF contains set percentages of glucose and protein. These percentages will vary with bacterial, viral, or other causes of meningitis. For example, bacterial meningitis causes a smaller than normal percentage of glucose to be present in CSF, as the bacteria are essentially “eating” the host’s glucose, and using it for their own nutrition and energy production. Normal CSF should contain no infection-fighting cells (white blood cells), so the presence of white blood cells in CSF is another indication of meningitis. Some of the withdrawn CSF is also put into special lab dishes to allow growth of the suspected infecting organism, which can then be identified more easily. Special immunologic and serologic tests may also be used to help identify the infectious agent. In rare instances, CSF from a lumbar puncture cannot be examined because the amount of swelling within the skull is so great that the pressure within the skull (intracranial pressure) is extremely high. This pressure is always measured immediately upon insertion of the LP needle. If it is found to be very high, no fluid is withdrawn because doing so could cause herniation of the brain stem. Herniation of the brain stem occurs when the part of the brain connecting to the spinal cord is thrust through the opening at the base of the skull into the spinal canal. Such herniation will cause compression of those structures within the brain stem that control the most vital functions of the body (breathing, heart beat, consciousness). Death or permanent debilitation follows herniation of the brain stem. Because meningitis is a potentially deadly condition, doctors should be contacted immediately for diagnosis and treatment. Alternative treatments should be used only to support the recovery process following appropriate antibiotic treatments, or used concurrently with antibiotic treatments. Patients should be well rested in bed, preferably in a darkened room. They should be given lots of fluids and nutritious foods. Patients should avoid processed foods and those with high fat and sugar content. Fats are difficult to digest in severely ill patients; sugar tends to depress the immune system and impede recovery process. Patients should also take vitamin A (up to 10,000 IU per day), B-complex vitamins (up to 1,500 mg per day), and vitamin C (up to 2 g per day) to help keep the body strong and prevent future infections. Additionally, the patient may consider taking other antioxidants, essential fatty acids (EFAs), and/or participate in therapies, such as massage therapy and movement therapies (e.g., t’ai chi). Alternative therapies, such as homeopathy, traditional Chinese medicine, and Western herbal medicine may help patients regain their health and build up their immune systems. The recovering individual, under the direction of a professional alternative therapist, may opt to include mushrooms into his or her diet to stimulate immune function. Contact an experienced herbalist or homeopathic practitioner for specific remedies. Antibiotics are the first line of treatment for bacterial meningitis. In recent years, however, doctors have turned to such newer medications as vancomycin or the fluoroquinolones to treat bacterial meningitis because strains of S. pneumoniae and N. meningitidis have emerged that are resistant to penicillin and the older antibiotics. Because of the effectiveness of the blood-brain barrier in preventing the passage of substances into the brain, medications must be delivered directly into the patient’s veins (intravenously) at very high doses. Antiviral drugs (acyclovir) may be helpful in shortening the course of viral meningitis, and antifungal medications are available as well. Patients who develop seizures will require medications to halt the seizures and prevent their return. Viral meningitis is the least severe type of meningitis, and patients usually recover with no long-term effects from the infection. Bacterial infections, however, are much more severe, and progress rapidly. Without very rapid treatment with the appropriate antibiotic, the infection can swiftly lead to coma and death in less than a day’s time. While death rates from meningitis vary depending on the specific infecting organism, the overall death rate is just under 20%. The most frequent long-term effects of meningitis include deafness and blindness, which may be caused by the compression of specific nerves and brain areas responsible for the senses of hearing and sight. Some patients develop permanent seizure disorders, requiring lifelong treatment with antiseizure medications. Scarring of the meninges may result in obstruction of the normal flow of CSF, causing abnormal accumulation of CSF. This may be a chronic problem for some patients, requiring the installation of shunt tubes to drain the accumulation regularly. Some cases of sudden and unexplained death in adults have been attributed to rapidly developing meningitis. Prevention of meningitis primarily involves the appropriate treatment of other infections an individual may acquire, particularly those that have a track record of seeding to the meninges (such as ear and sinus infections). Preventive treatment with antibiotics is sometimes recommended for the close contacts of an individual who is ill with meningococcal or H. influenzae type b meningitis. A meningococcal vaccine exists, and is sometimes recommended to individuals who are traveling to very high risk areas. A vaccine for H. influenzae type b is now given to babies as part of the standard array of childhood immunizations.